Melodeath has certainly been overdone over the past few years, with more bands coming into the genre than I care to think about. Archons hail from Quebec, Canada and play a style of melodic death metal that is pretty modern when compared to the older work of genre giants At The Gates or In Flames. However, the Canadians show that they know what they're doing in this time of overdone clichés and empty posturing. Even so, they also show that they're still a young band that needs to find a solid direction. The intro track starts with a combination of guitar and synths that actually succeeds in getting my attention, I start to think this might actually be an interesting album. This is a sort of cliché melodic death metal intro, but it doesn't sound too bad. The Enigma Of Torments starts out with some solid guitar melodies. The vocals are quite well done, not the most original, but they sound good, reminding me somewhat of Mikael Stanne from Dark Tranquillity. The song has my attention for the first half, but then it sort of trails off after the excellent guitar solo. I think this would be a really great song if it weren't so damn long. Of Pride And Prejudice starts out strong with some interesting guitar melodies. There are also some interesting vocals about halfway through the song. However I again start to lose interest after the song passes the four-minute mark. Wandering The Burning Land is a good song that has a really epic feeling. The melodies change from time to time, but not in a way that distracts from the overall feel of the song. This is a longer song that is done right. The remaining four tracks come out sounding much like the first four. There are a few interesting and a few not so interesting things thrown in, but in the end it all comes out sounding extremely heavy and somewhat catchy, but not really going anywhere. I realize that there will be those who rave about this album and others who will flat out despise it. For an album like this to really appeal to me there have to be tracks that just jump out at me and refuse to be ignored. Something that makes me sit up and say "What IS this?!" Unfortunately I do not find much of that here. The good news is that these guys clearly know how to play and how to perform. They know how to write songs. Unfortunately the song structures on this album are mostly forgettable. Nevertheless I am still impressed by this band. They deliver their songs with power and emotion while never feeling the need to resort to cheesy breakdowns or even clean vocals for that matter. I believe that they could have a really great, iconic sound if they simply take the time to go back to basics with the song writing. 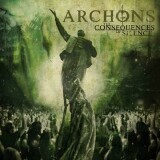 Overall this is a solid first effort from Archons.